Email preference centers have been around for a long time, and far too many haven’t been updated since they were first published. Let’s talk through the necessities and nice-to-haves of a solid preference center and banish the boring forms of the past. The level of complexity for most legacy preference centers tends to be low. Most, if not all, ESPs offer a system default subscription center that is generic in both design and functionality. Despite this, these default options achieve the minimum requirements for their intended task and require little effort to implement, which is likely why so many brands use them out of the box. But not every brand is satisfied with the default solution. From design to level of detail, many brands seek to offer an experience that aligns with their brand guidelines and offers subscribers a way to tailor their communications at a very granular level. 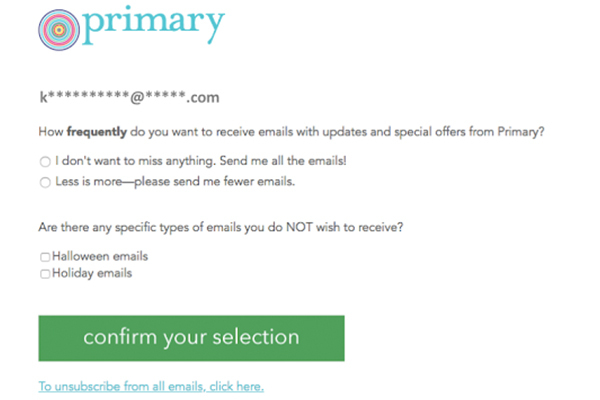 Children’s clothing company Primary gives subscribers the option to adjust overall email frequency as well as opt out of Halloween and Holiday focused emails. 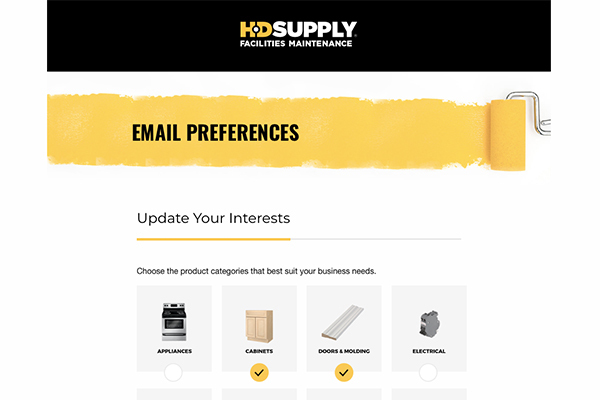 Giving subscribers more control over how a brand engages with their already-full inboxes increases the relevance of communications, thus decreasing mailer fatigue and related unsubscribes. Preference selection types: Preference centers can allow subscribers to control the frequency / timing of email communications, the content communicated, or a hybrid of both. Offer your subscribers as much control as you are able to, but don’t overcommit. Frequency and timing preferences can be challenging to manage, and the worst thing you can do is offer subscribers a choice that you don’t fulfill. Advanced preference options: Identify any preference options that can be used to further segment your audience to deliver targeted or dynamically relevant content. Le Creuset allows subscribers to select both frequency and content preferences, and goes even further by giving them the option to truly tailor their content by color, experience level, and product preference. Poll subscribers directly: A direct request to a key group of engaged customers can provide clear insight into what would be most valuable to them in a preference center. This is easily done with a basic survey and provides input from people who care most about a brand with the added benefit of reinforcing loyalty with a valuable customer segment. Reinforce your brand tone: The copy in your preference center provides an opportunity to reinforce your brand tone and voice, creating a cohesive experience for customers. 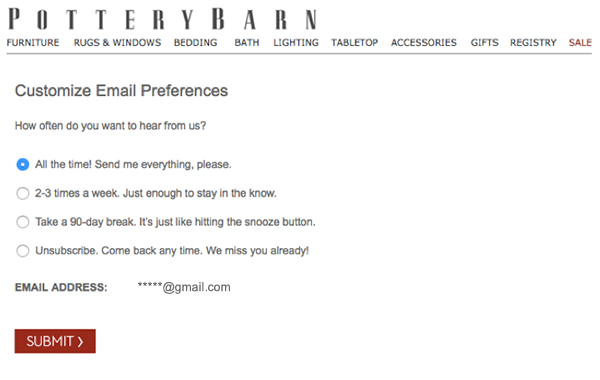 If your brand is fun and quirky be sure to deliver a similar experience in the preference center. 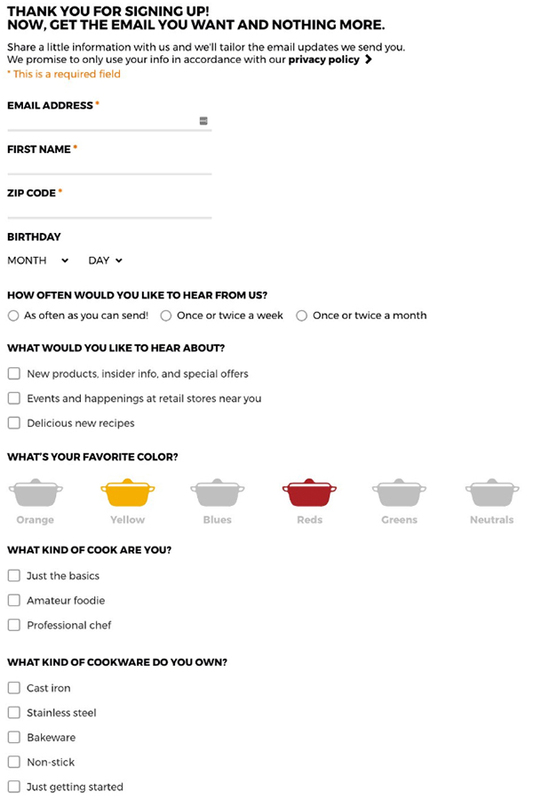 Incorporate visual selections: To help break up the visual flow consider including some visual options, as shown in the “What’s Your Favorite Color?” section of the Le Creuset preference page (above). Look through the data: Evaluate data to identify patterns of interactions with your brand content. Use this to help determine the types of subscription options you offer. 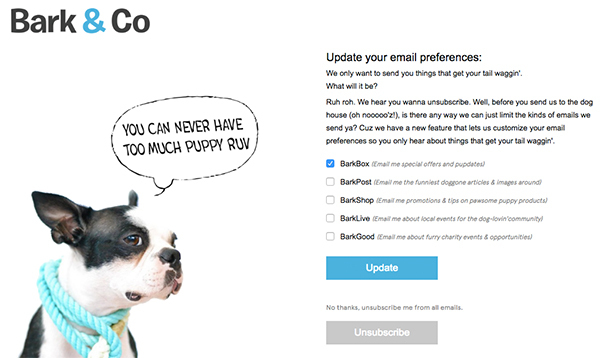 Include opt-down options: Reduce unsubscribes further by offering “opt-down” options, such as reduced frequency or subscription pauses. Pause functionality allows subscribers to take a break from your email program for a period of time without fully disengaging. Once the pause period is up the subscriber will begin receiving your emails again. Preference centers and subscription management can be instrumental in taking your email program to the next level. Consumers appreciate options and, according to the cardinal rule of email marketing, should be able to opt in (or opt out) of whatever communications they please. Allowing them to explicitly share their preferences creates a good experience for consumers and a wealth of useful segmentation data for marketers, a true win/win scenario. 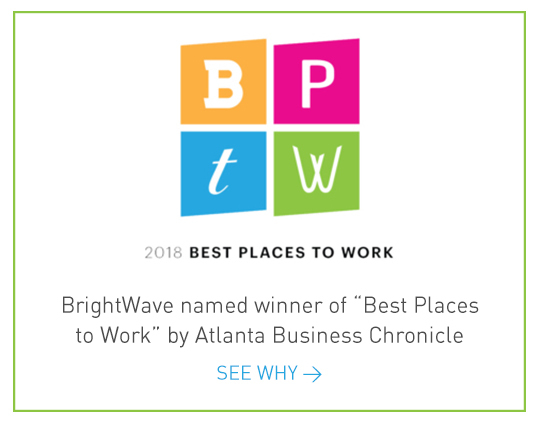 Our BrightWave team is incredibly responsive to our needs and is critical in helping us drive and measure positive customer engagement during a pivotal time in our business.